Our first day was off to a very auspicious start. Sunny, George, and I had flown out to Los Angeles on Friday night, and put the constipation that is LA behind as we crossed the Santa Susanna and San Gabriel mountains, and dropped down into the edge of the dry lake bed where Palmdale sits. Since we had not adjusted to the jet lag, and knew we had a full day ahead of us, we were up well before sunrise. Earl, who had driven over from his home in Montecito, met us at the appointed hour and we enjoyed a "last" real breakfast. It is a goodly drive to our first dropping off point, the trailhead at the end of Symmes Creek. 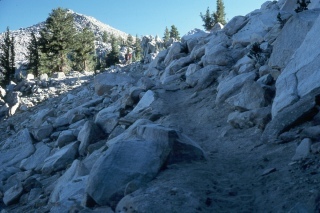 The trailhead, at 5700 feet, sits in a desert-like environment more than 6000 feet below Shepherd Pass, what Sierra South calls the single most difficult trail pass in the Sierra Nevada. Which was one reason why we were planning on hiking down from the pass, rather than up it. 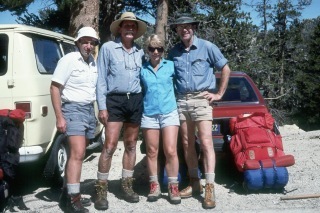 We dropped off Earl's Suburban, packed the four of us into the minivan, and headed back to Lone Pine. We stopped in the Forest Service office to use the facilities. Wow: the place was like the staging area for an assault on Everest: the lawn was littered with humans and all manner of backpacking gear, all waiting for a chance to get to the summit of Whitney. I wondered how crowded the summit would be when we got there several days from now. We had a bit of an inkling when we arrived at the Cottonwood Pass/Horseshoe Meadow trailhead. It seemed that the road was lined with vehicles for a half a mile. Driving back and forth, we finally found a parking spot only a hundred yards from the actual trail head. I thought to myself, no wonder they have a strict access permit system for these mountains. Think what it would be like with ad libitum access. It was getting on to mid-afternoon, when we finally saddled up ourselves (we did feel a bit like our own packhorses) and trundled up the trail to Cottonwood Pass. I was struck by how dry everything seemed to be. It seemed like every step on this well troddened path stirred up a horse-sized cloud of dust. In the warmth of the afternoon, it seemed like climbing less that 1500 feet to the pass was overdoing it. A night in Palmdale, which sits at 2600 feet, provided virtually no acclimation for this high elevation. To start hiking so high above where I had slept the previous night was a strain, and I appreciated the gentle trudge around the edge of Horseshow Meadows. I had only planned to make a mile and a third per hour, and I was certainly keeping that pace - barely. We stopped for a rest in some welcome shade after about an hour, and drank a lot of water. The Cottonwood Pass trail is a good news/bad news trail. The good news is that it has a high elevation trail head, and it is relatively flat for the first couple of miles. 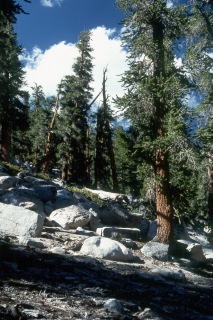 Of course, the bad news is that it thus gains virtually all of its elevation in the last two miles to the Pass. Everyone seemed to be in pretty good spirits, and all were thankful for the thirty or so switchbacks that take the curse out of the assault on the Pass. George and Earl were doing pretty well, Sunny was within sight, and as usual, I was dragging up the rear. I was using photography as an excuse to slow down, and let my lungs gasp for breath. As we pulled into the pass, the lighting was already starting to turn to that golden evening glow. Sunny and I took a few pictures, but knew we had to move on to Chicken Spring Lake. The Lake is in a small cirque, and has some pretty nice camping along its southeast side. However, many many folks had already beat us to the really terrific spots, so we opted for some pretty good spots near the outlet stream. Earl exclaimed that the weather looked so good that he was not even going to bother with erecting a tent, and just spread his sleeping bag out on a groundcloth. The rest of us opted for more conventional accommodations. By the time Sunny and I cleaned up, and fixed dinner, we were not long for bed. We knew we had a big day tomorrow, and while George and Earl opted to stay up and watch the stars, I knew I needed all the sleep I could manage.